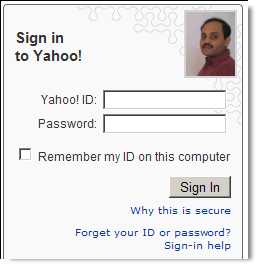 No, this is not for any fun or creating a personlized sign-in page, the Yahoo! Text or Image Seal is a wonderful security feature that would prevent you from supplying your Yahoo! login credentials to a phishing site. The Yahoo Sign-in seal works like this. You begin by sharing with Yahoo either a secret text (like your street address or girlfriend's name) or a personal photograph that anyone who uses your computer can recognize (like a picture of your dog or even a family photograph). Now when you visit the genuine Yahoo! sign-in screen on that computer, you'll also see you message or photo. If the message, photo, or colors are different or missing, you may have landed on a phishing site. Don't sign in. This amazing feature may be a big relief to all Yahoo! users. I strong feel that Google, eBay, Paypal and others must follow the footsteps of Yahoo here. It will just make the online world a more safer place to live, interact and shop.